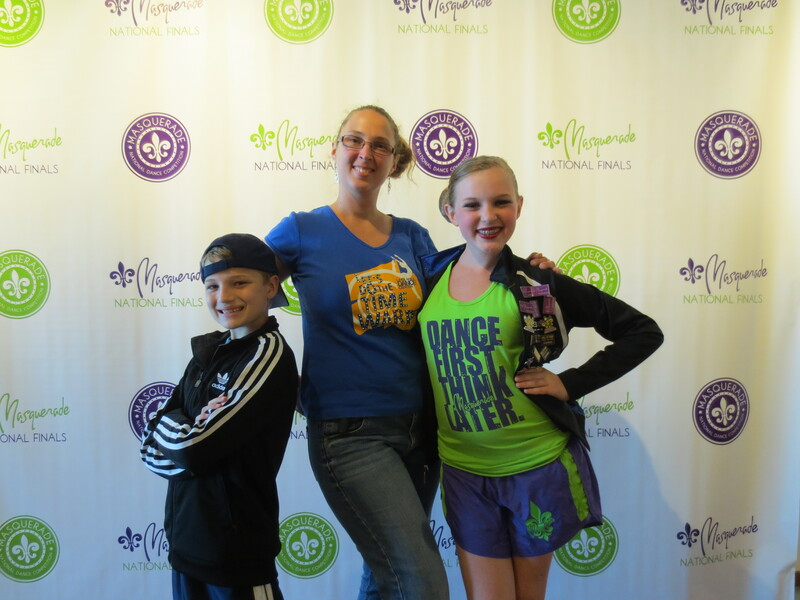 Last month was Nationals for Masquerade here in Burnsville, MN. It was a very busy week, but also, a fun one! Events started for us on Saturday. Grace attended Master Classes. It was 5 hours of classes in various styles. Many of the teachers were judges for the competition. The cost for 5 hours was only $65. I think we paid this or more for 4 hours of dance in past years. It definitely felt like a good value! This was her first year dancing with the seniors. She said it was very hard, but also that she loved it! The one class she talked about most was tap. She LOVES tap! There were a lot of new moves with names she had never heard. The older girls tended to be in the front, so the younger or shorter ones were in the back trying to keep up. Grace says she struggled, but never quit trying. She really enjoyed dancing with some of the girls who she had watched in years past (like Sylvia Borasch, last year’s Title winner, who’s tap style she wants to emulate). The only class she was disappointed they didn’t have, was hip hop. She can’t wait until she gets to take Master Classes again next year! Junior solos were happening at the same time as Senior Master Classes, so Michael and I got to watch many of the girls from our studio perform their solos. We didn’t often get to see those during the competition season. Photo courtesy of Masquerade’s facebook page. Every year, there is a welcome party. We didn’t go the first year, but regretted it. Last year, it was karaoke and pizza in the courtyard. 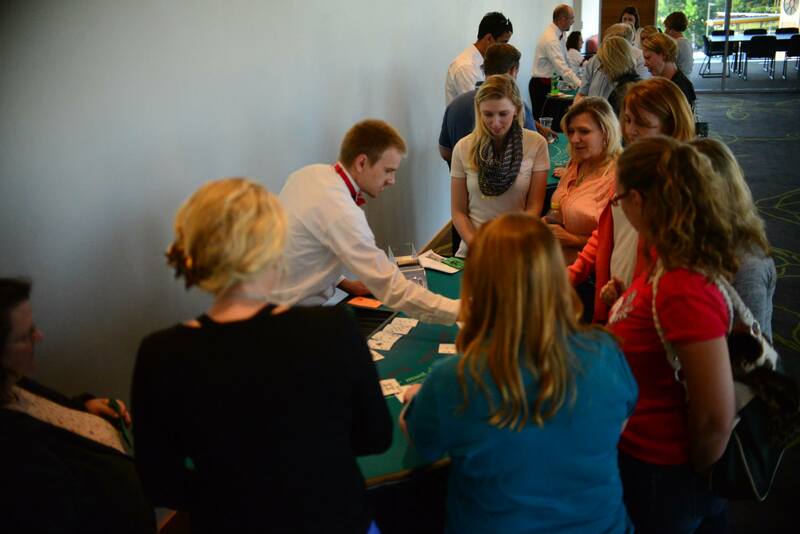 This year, it was a “MasqueRAVE party” for the kids, and Casino night for the adults. In the upstairs lobby area, there were casino games, and a cash bar set up. When we got to Casino Night, they gave us each $2000 in fake money to play with. The dealers were able to break our money down into smaller denominations. There was Black Jack, In Between, Beat the House, and a couple other games. Most of the people there were parents from our studio, Lake Area Dance Center (LADC). At the end, we were to add up all our money, and top earners would win reserve seating at Finals, credit in the apparel shop, and more. Though it was mostly LADC parents, we didn’t beat the odds. Another group of parents won most of the prizes. I wish everyone would have gone into a drawing for things like t-shirts, and other prizes, but that was not the way it was set up. Oh well… It was still a lot of fun! The MasqueRAVE was fun for the kids, but since there had been pizza in years past, many of them hadn’t eaten, and were hungry. Luckily for my kids, I had fed them before we headed out there, but of course, they got hungry anyway… They were in a studio sized room, and got really hot from all the dancing. Several glowstick-clad kids came up and asked for money for snacks or food, or for us to hold their jackets. Luckily, the kids were free to go outside. Many did to cool down, but then headed back in for more dancing. They had a great time. I hope they do next year’s welcome party a similar way, but also have some sort of food and beverages (even if just appetizers or snacks). I enjoyed hanging out with the other adults, not focused on dancing or our children. 🙂 The kids got to meet people from other studios in a non-competitive, fun way. I love that so many competitions are starting to get on the live streaming band wagon!! I had to work Monday, but Grace was able to watch dancers from our studio and others compete all day long! Also, I was able to keep friends and family members in the loop as to when LADC’s dances were about to perform. On Tuesday of Nationals week, the small groups performed. Grace’s tap small group was to perform at around 8:45 in the morning. Doors didn’t open until 7:15, so while it was an early morning, it wasn’t as early as some competitions! 🙂 They did an awesome job, and received a Platinum score! This competition was run a bit differently than some others we have been to. All the small groups competed in one day. It started with the youngest recreational group in a given division, then worked its way up through senior elites. All dances of a particular style were first, then it started over in the next style. Tap groups were first, then musical theater, then jazz, etc. What I liked about doing it this way, was that we got to see Elite level small groups scattered throughout the day. Elite generally equals fantastic dancing. Very enjoyable, for sure! The downside of being scheduled this way, was that overall awards weren’t until evening. That makes for a long day. Many dancers from Grace’s group didn’t hang out for the whole day, but we wanted to cheer on team mates, and watch all the incredible dances. We were glad they were running over an hour ahead of schedule, so awards weren’t as late as they otherwise would have been. Also, it was a gorgeous day outside. 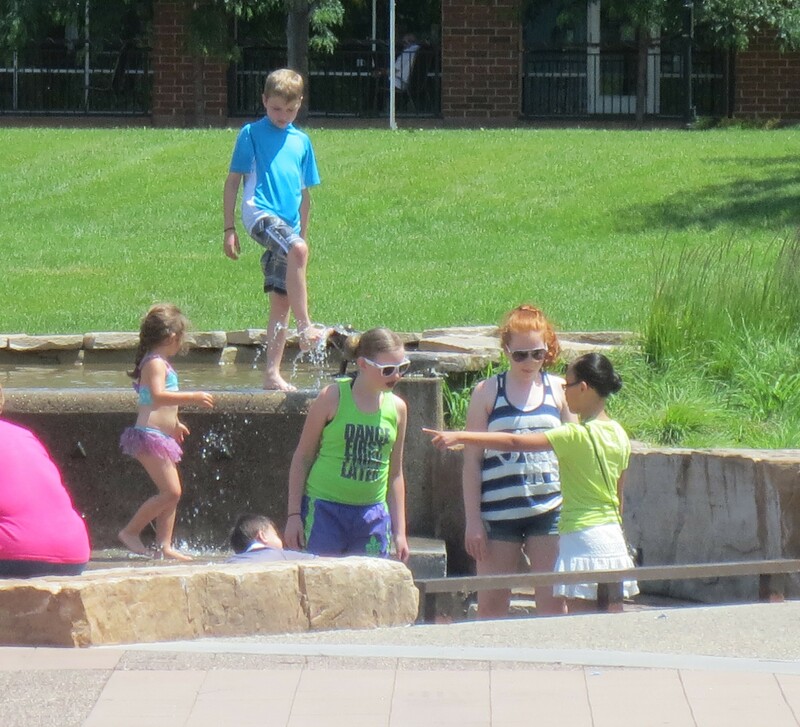 The kids spent some time playing in the fountains, while the parents soaked up the sun! 1st in the Senior Intermediate Small Group category. It was difficult for the youngest dancers at our studio. Some of them left to take naps or otherwise rest, and came back. Others stayed until they danced, but left before awards. On the upside, they were running about an hour and a half ahead of time, so they danced their afternoon/evening dances much earlier than expected. Awards were not as ahead of schedule as we would have hoped due to a parent dance off and extra time given to judges to decide who would dance in the finals. That said, they were still earlier than scheduled. 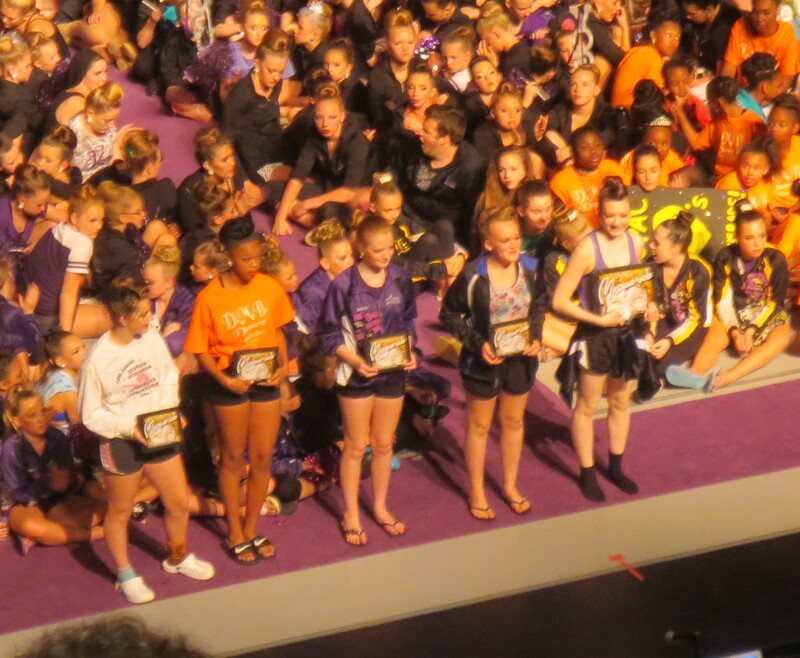 1st (jazz), 2nd (tap) and 5th (contemporary) in the Teen Intermediate Large Group/Line category. Jazz also received a “Joyful, Joyful” Judges’ Award for dancing such a wonderful celebration of life! Several dances were also nominated for Audience Choice Awards. Several dances from our studio made it into the Finals the next day. It was a long and exciting week. We always enjoy our time at Masquerade Regionals and Nationals. They run a great competition!